Note: This is NOT a guide, but just a brief report of a 2-night story during which I decided to give a chance of freedom and versatility to my laptop IBM Thinkpad X31. The Thinkpad comes without an internal CD drive, so I have used an external USB CD-drive. If you decide to completely remove the pre-installed Windows XP, you don't need to prepare anything, just remove all the partitions during installation. If you opt for a dual-boot system, you need to make some room for Linux. To remove the PreDesktop Area (this was my choice), hit F1 soon after powering up to get to the BIOS. Here you can disable the "Predesktop Area", so that operating systems can now see the hidden partition. Now we need to burn the installation CD. Download the ubuntu netinst iso image from Ubuntu download and burn it to a CD. To run network-manager the first time, just type nm-applet into a terminal session. The nm-applet will be restarted if you save your gnome session on logout. Check that in [ System --> Preferences --> Sessions ]. You may also don't save your session and put nm-applet into the gnome StartUp Programs, with a priority of 90. Uncomment and change the line starting with THINKPAD. You can put here whichever program you would like to start by pressing the "Access IBM" button. I use: THINKPAD /usr/bin/gnome-terminal. giving a priority of 99 (this will ensure that tpb will be the last program called during gnome startup) and restart the X31 ! You will have now OSD enabled for buttons like Volume Up/Down, Thinklight On/Off (Fn+PgUp) and Access IBM. In order to get it working, you need to install the package sl-modem-daemon which is in ubuntu multiverse. Once installed the package, your modem will be available on port /dev/ttySL0 ( or /dev/modem). Now move to /etc/default and edit (with root privilegies) the file sl-modem-daemon. Browse to line SLMODEMD_COUNTRY= and type your country name (ITALY in my case...). Note: This last point is very important. I have been struggling for days before realizing that! Now your modem is working. Just setup a dial script (with pppconfig or gkdial) and go online. DKU-2 seems to be a passive cable (unlike DKU-5). Nokia 6230 has a built-in USB-serial converter that's how the vendor and product IDs. Device is supported by usbserial module with generic serial support (CONFIG_USB_SERIAL_GENERIC=y) enabled, and this is how Ubuntu's kernelis configured. 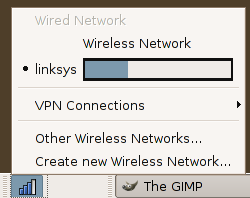 Use the phone to make a GPRS/EDGE network connection. With these settings the phone is correctly detected by gnokii and (almost)all functions are enabled. In order to have a full control over 6230 and allow gnokii to detect the DKU-2 cable, a kernel patch is needed. See this. or use a graphical dialer, such as gkdial. Now just reboot your X31, and you will have Fn+F12 full working. Now, each time you plug in a CompactFlash Card, your X31 will mount a disk in /media/CF.